With a global launch in the works and the hopes of diehards at an all-time high, the pressure was on BlackBerry and TCL to deliver on all that Mercury hype. We can't render an official verdict yet, but my gut tells me they're onto something. Say hello to the BlackBerry KEYone. Yes, "Mercury" was a better name, and yes, the capitalization is weirding me out too. No matter: Despite the nature of its creation, the KEYone feels like a pretty triumphant return to form for a brand in need of a boost. The hardware hasn't changed since the phone first broke cover at CES, but we now know what makes it tick. Inside is one of Qualcomm's octa-core Snapdragon 625 chipsets, with an Adreno 506 GPU, 3GB of RAM and 32GB of built-in storage. (Thankfully, you can toss in a microSD card as large as 2TB, just to be safe.) While that's certainly not the fastest piece of silicon out there, BlackBerry Mobile says it chose the processor "very specifically" to work in tandem with the 3,505mAh battery to deliver battery life that can stretch into two full days -- another classic BlackBerry trait the KEYone tries to channel. I wouldn't worry a whole lot about performance, by the way. We've seen that exact load-out before in devices like the Moto Z Play, and while it won't necessarily blow you away, I was more than pleased with how quick this little thing was. Even with a non-final version of Android 7.1 Nougat onboard, navigating through menus and frenzied multitasking were no problem -- just what you'd want in a device meant specifically to get things done. Up front is that 4.5-inch display running at a slightly odd 3:2 aspect ratio. Everything on that 1,620 x 1,080 screen looks crisp, though it takes a little getting used to. To hear the company's pitchmen tell it, the KEYone was purpose-built for people who appreciated the things that made old-school BlackBerrys so great. It stands to reason that the people involved agonized over the keyboard, and they've done a great job: I've used every BlackBerry with a physical QWERTY since the BB10 days, and I'm pleased with how the keys depress and spring back into place. It will take a lot of retraining to get my chubby thumbs weaned off a glass touchscreen, but even a few moments with the KEYone made me feel like I was up to the challenge. Even better, you can slide your fingers across the keyboard to swipe between home-screens and down webpages. Each key also doubles a shortcut for an app or action (think: holding down the L button to launch Lyft). I'm seriously thinking of buying a KEYone just for that. 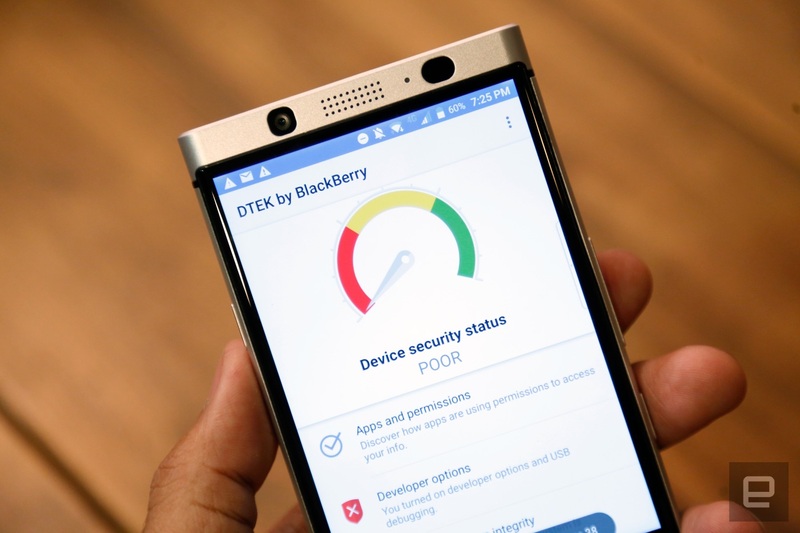 That functionality is complemented by BlackBerry's spin on Android, and very little about the experience has changed since the days of the DTEK50 and DTEK60. Now we're getting to that other thing BlackBerry has pushed for decades. The main draw (beyond the keyboard, natch) is the hardened kernel BlackBerry has worked to bake into Android itself -- spokespeople eagerly call it the most secure Android device in the world, and apps like DTEK should help even laypeople figure out how to make their phones a little safer. Then there's the other stuff that should be table-stakes in a flagship phone. BlackBerrys have never offered great imaging performance, but the company went surprisingly big with the KEYone. Tucked away in the phone's back is a 12-megapixel, Sony-made IMX378 camera sensors, like the one seen in Google's Pixel and Pixel XL. I didn't get much time to play with the camera in bright daylight, but the photos I did shoot were fairly detailed and well colored, even in low light. The Pixels use a lot of really impressive machine-learning to make photos taken with their cameras really pop, so don't expect the KEYone to steal Google's imaging crown. Even though the software driving it still needs some fine-tuning, the KEYone's camera seems leagues ahead of those used in other BlackBerrys. Ultimately, the phone's designers didn't want to build a phone for everyone or a phone that excelled at everything. They tried that once with the Priv, and you probably remember how that went. (Quick reminder: It was mostly just OK). This newfound focus is both refreshing and intelligent. 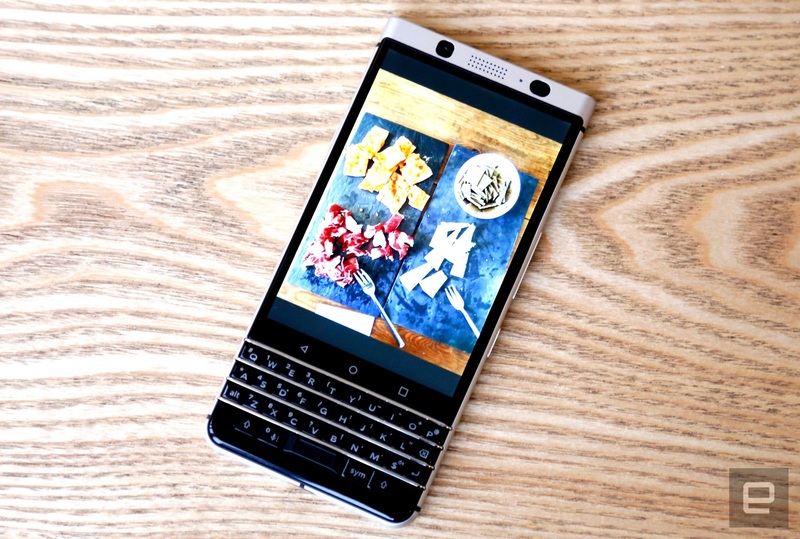 BlackBerry Mobile admits the KEYone is a niche device but considers it an important part of the growing BlackBerry portfolio. Building a strong foundation of phones is how BlackBerry and TCL plan to turn things around, and at least some of the carriers that didn't love the Priv are taking note. The KEYone is set to launch in multiple markets in April, and we're hearing that the US is lower on the list than other places. Fair enough. Even so, the company confirmed that, in addition to being sold unlocked for $549, carriers will almost certainly offer the KEYone too. That's good news for you -- you can pay for one by the month -- and even better for BlackBerry. Carrier deals mean more visibility, and the company could definitely use it. 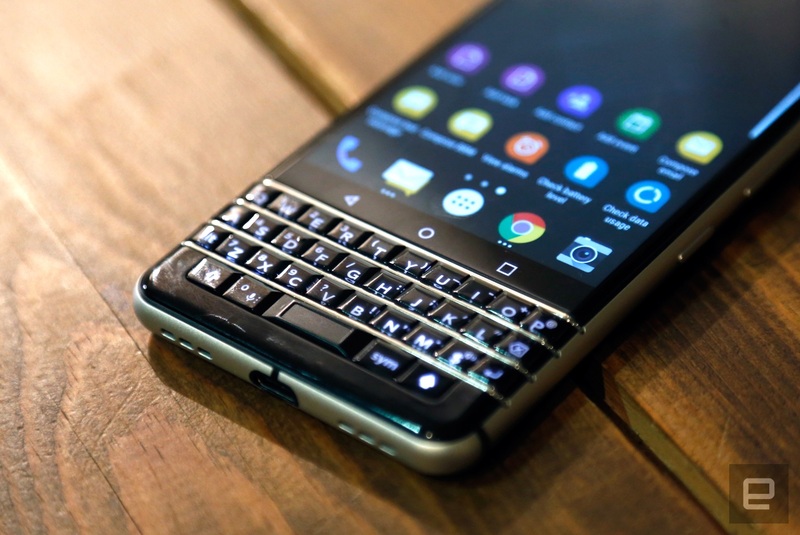 As I've said, we'll hold off on passing judgment until we get to play with some final hardware, but I feel something for BlackBerry now the company hasn't given in me years: cautious excitement.